The ganguro girls get a power-up! 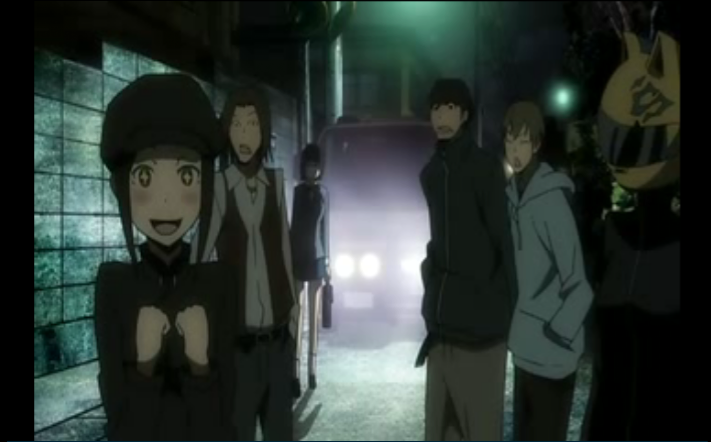 Episode 16 of Durarara!! plays bait and switch repeatedly, providing a cascade of plot twists, and ending at an incredible cliff hanger. This review looks at this excellent episode as seen by the ani-blogosphere. Surprisingly, the big fight we were led to expect from last episode is over in moments. Celty picks up what she believes to be the demon blade, and drives Anri home. Wouldn’t you know things aren’t gonna be that simple? Now Anri is defenseless, and she lets one crazy-looking schoolgirl into her apartment. Meanwhile Shizuo goes over to Izaya’s to pick a fight. 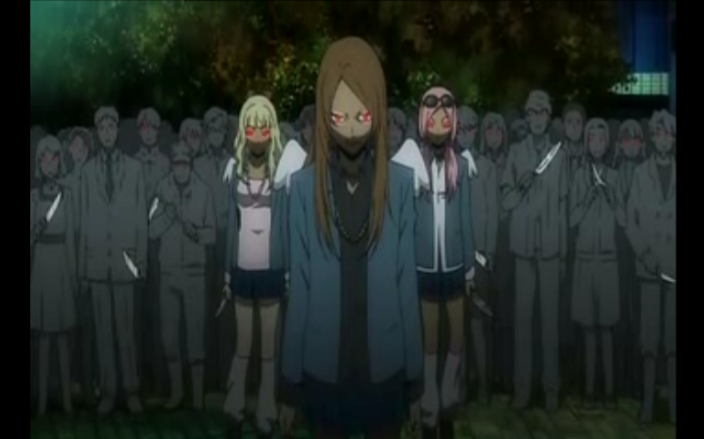 This is where the real twists begin, as both Anri and Shizuo are switched from their secondary enemies (the first being the possessed reporter who was dispatched in moments) to a growing horde of zombie-like children of the demon blade, Saika. But this episode wouldn’t be masterful without yet another twist in the plot. Erika gives voice to the love that dare not speak its name. Given the amount of interest previously expressed in the fan community, it is not surprising that many were thrilled when Erika declared her interest in the Izaya x Shizuo pairing. Sapphire Pyro has the angle covered on Hyper Parfait, including a detailed interpretation of their heated encounter. 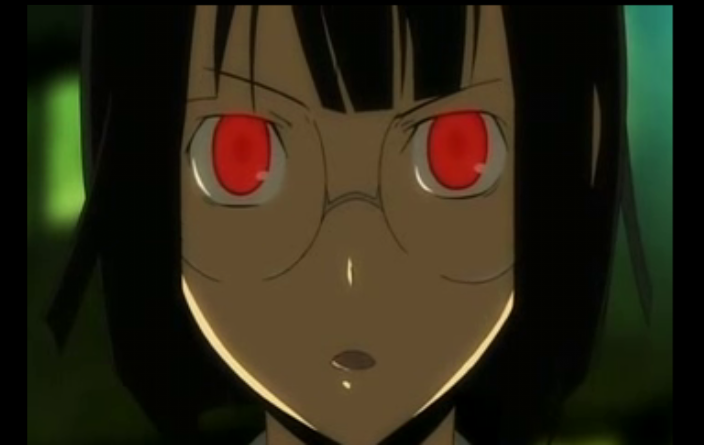 Meanwhile Scamp throws some fuel on the fire with a gender-bent Shizuo that has to be seen to be believed. Caraniel comments on Shizuo’s relationship with Izaya as well. In this episode, Shizuo declared Izaya behind 99% of the bad stuff that happens in town, an allegation that Izaya accepts as reasonable. As Caraniel points out, it seems like next week will be narrated by Izaya, himself, which should be quite revealing. PSgels (Star Crossed Anime) and Andy (Hanner’s Anime) are pretty much in agreement that this was the episode from the second half of DRRR that grabbed their attention. The last three episodes have been laying groundwork, but haven’t really been as exciting, or in this case we might say, “suspenseful”. You just HAD to make her angry, didn't you? About Saika, form what I understand, the real Saika is Anri’s katana, while the one with Niekawa was thought of as Saika at first but is actually just a child of the original Saika. The biggest advantage to my metaphor: The promise of Anri in secretary garb. @Ruby: Thx, I had seen other bloggers use this style before, and wanted to try it. I didn’t quite acheive what I wanted to, but everything is a learning experience. @Shinmaru: She has the whole glasses thing going already, so, if she took off the school jacket, all she really needs is a stenographer’s pad. Even with demonic powers, those kogal bullies are going to get owned, and then Shizuo is going to smash all of their cell phones. @Kabitzin: Yes, I fully expect them to get stomped by Shizuo. Its kind of a shame that Anri won’t get a chance to do it herself, although that might work out to their benefit, as Shizuo just lays the smack down. As long as they stay down I think he’ll move on to another target. I get a feeling Anri + Katana means anyone she takes down doesn’t get up again. Great episode! really enjoyed this one, Finally get to see Anri’s role in the show. Can’t wait to see Shizuo take out those “zombies” and I agree with Joojoobees Anri’s sword might kill the slashers for good.